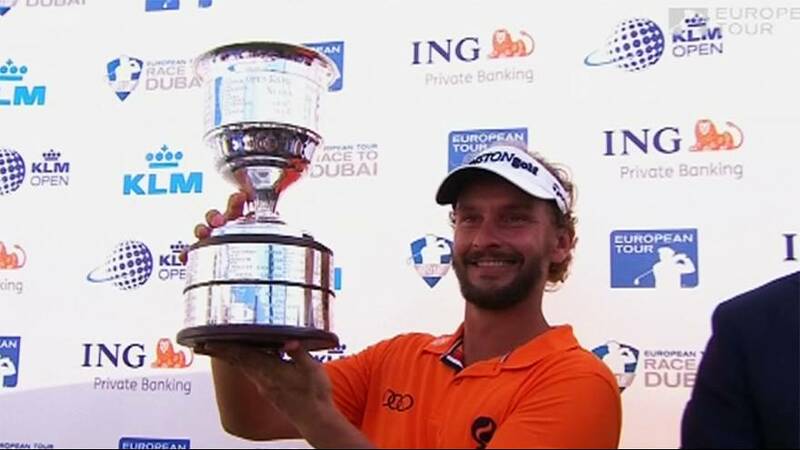 Joost Luiten of the Netherlands made ten birdies in a final 8-under-par round of 63 to win the Dutch Open by three shots. Luiten came into the final round two shots behind overnight leader Scott Hend, but the Australian dropped out of contention after finding the water at the 9th and 15th holes for a pair of double bogeys. The round soon became a battle between the Dutchman and Bernd Wiesberger of Austria, but birdies at the 14th and 15th holes followed by a bogey by the Austrian at the 17th gave Luiten a cushion. Luiten’s tenth birdie of his round at the 17th stretched his lead to three shots allowing him to par the last hole to complete his fifth win on the European Tour. Luiten finished with a 19-under-par total of 265, with Wiesberger’s round, which included an eagle at the par-5 sixth, a six-under 65. An Byeong-Hun of South Korea (65) was third, three shots further back, with Hend in a tie for fourth on 12-under after a disappointing round of 2-over 73.